ACP Applied provides top-of-the-line crack treatment services for all types of roads, from parking lots to highways and everything in between. An economic annual treatment, an ACP Applied cold pour crack treatment will keep water out of the crack over the winter, although the crack may reappear in the spring during melt. ACP Applied can apply its emulsion-based cold pour crack treatments to any length of crack – from the shortest split to miles-long cracks requiring multiple tanker loads of emulsion. It doesn’t matter what the application is; ACP Applied treats parking lots, municipal roads, highways, or any other paved surface suffering from cracking. 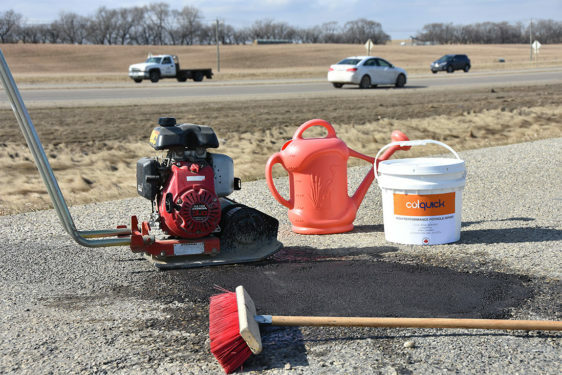 A premium crack treatment, ACP Applied’s hot pour mix utilizes a rubberized asphalt sealant to achieve superior performance for treating cracks up to 1 1/2″ wide. Also known as overband surface sealing, hot pour crack treatments are useful for wider cracks where a cold pour treatment won’t suffice, and can be applied in weather conditions of as low as 5 degrees Celsius. As suppliers and distributors of Crafco sealants and equipment, including routers, ACP has access to the specialty equipment as well as the expertise and experience, to provide you with a quality hot pour crack treatment. When cracks exceed 1 1/2″ width, a spray patch treatment must be considered. When considering a spray patch, keep in mind that it is a temporary, annual fix meant for pavement preservation. It is not a substitute for chip sealing. Spray patching uses specialty Crafco equipment to deliver a layer of emulsion to the crack followed by a clear aggregate on top which should then compacted, although some maintenance applications don’t require it. As part of ensuring your project meets your needs, ACP will warranty compacted spray patches.